There a lot of wedding albums in creation out there, some designs look exceptional, and some need the extra something to turn them into a perfect wedding album. Delivering great design is an art. You should not underestimate the process. Plenty of thought needs to go into planning the perfect album, executing this thought pattern will ensure simplicity, and a clean look is maintained. Within this article we hope learn some helpful tips that will assist you in designing the perfect album for your clients. Good design is modern, simple and elegant, but most importantly the album you create should tell someone’s story. Essentially, through your photos, you are narrating a couples wedding day so keeping to a timeline of the day throughout the album pages is highly recommended. Also, think about including photos that help showcase the love story. The couple may have missed the smaller details on the day, but with your photos, wedding peripheries like jewellery, flowers and cake can intertwine with the more traditional images. Begin by investigating the type of wedding album you will be presenting. Is the album going to be traditional with a limited amount of dry mount pages or is it going to be a magazine style that can include more photos? Once you know the finished product think about composition and how the page design will look. Ensure you apply the same composition you use in capturing your photos to the album page. Think about leaving some white space around the images and try different page positions to maintain a clean look. At the same time if you have a standout photo, don’t be afraid to fill the page and let the emotion showcase itself. This type of design could also extend to allowing an image span across two pages. Balance is another critical point to make with simple page design. Like the composition, ensure each page is balanced with the previous to maintain the look. 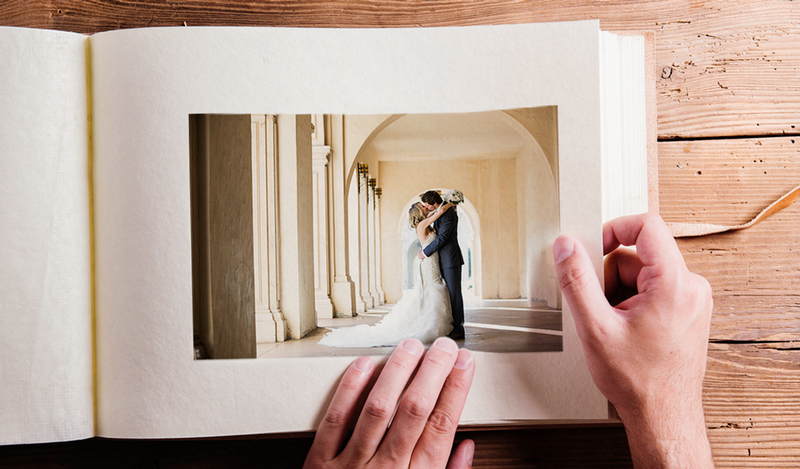 Knowing what photos to include in your wedding album, or more importantly what photos to leave out can be the difference between a cluttered design and one that’s clean and pleasing to the eye. Think about what photos are important to the couple and include those and instead of the ones you believe to be more important. Many wedding photographers use software like Smart Albums to help create a template for their wedding albums. Good software like the one mentioned will let you change your album design, so it reflects an elegant, clean look. When designing your perfect album ensure you tell stories in chapters. In other words, try and keep similarly themed photos on the same page. With these tips in mind we hope you enjoy designing your perfect wedding album, there’s no doubt you will impress your clients.